Valses / de Fr. 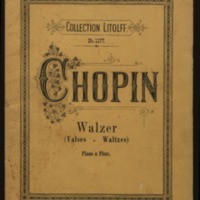 Chopin ; transcrites pour piano & flute par O. Standke. Part missing last page (page 21). The score bears the series number of the part, as well as its own number. Collection Litolff - no. 1177. Op. 18 -- Op. 34, no. 1-3 -- Op. 42 -- Op. 64, no. 1-2.